The date was October 3, 1918 – a little girl named Josephine was born in New Jersey to Lithuanian parents. When she was two years old her father sent her and her mother back to Lithuania to live with family while he worked to save money to bring them back to the United States. Her older sister stayed in America with him. 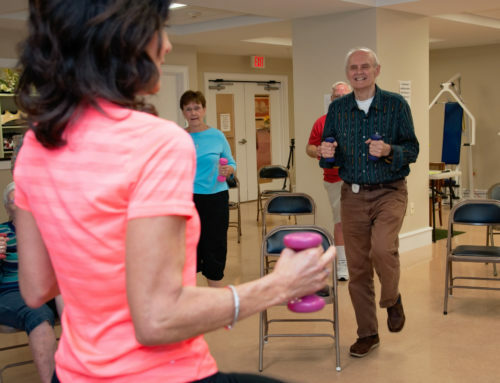 When Josephine was sixteen her mother, fearful of Hitler and war, sent her back to the US. When her older sister married she gave her job as housemaid to a childless couple to Josephine. Josephine affectionately called the couple Mama and Papa. Because of Papa’s work they moved to Indiana and then to Florida. She remembers sitting on a footstool at the foot of Papa’s chair while he taught her English. Mama died in 1956, and Papa adopted Josephine, giving her his name Hodgins. Josephine worked as a lady’s companion for a woman whom Papa knew in New York. Later she ran a gift shop in Long Island and then was with a wholesale house in the Gift Mart in New York City. 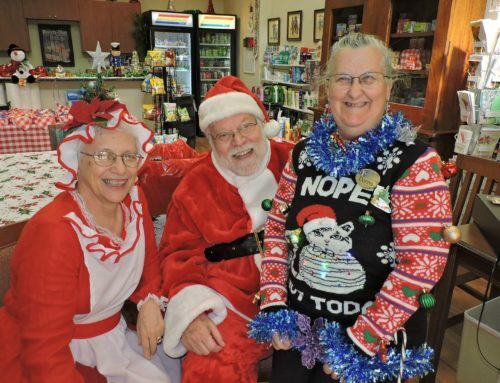 Josephine then purchased her own gift shop, the The Gift Tree in Nyack, New York. 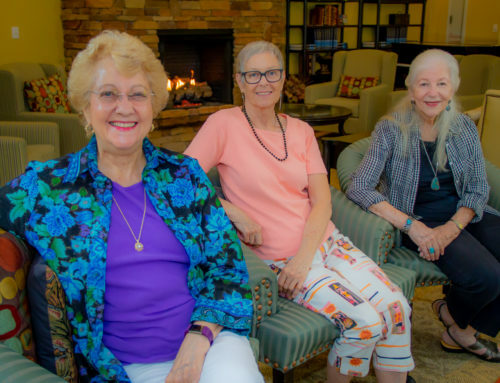 She remained dedicated to her community – she became a member of the board of directors of the Chamber of Commerce and the president of the Rockland County Soroptimists, a service club for professional and executive business women. Through her gift shop and her service in the Soroptimists, Josephine met several well-known women, including Helen Hayes and her theater and film friends as well as Imelda Marcos, and Alexandra Tolstoy. After some time, Josephine sold the gift shop in New York and moved to Indialantic, Florida. 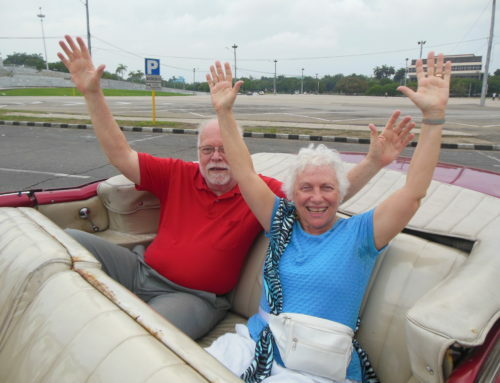 In 1997, when she was 79, she met and married James Bidwell. He died in 2005. Now Josephine lives quietly at Buena Vida. 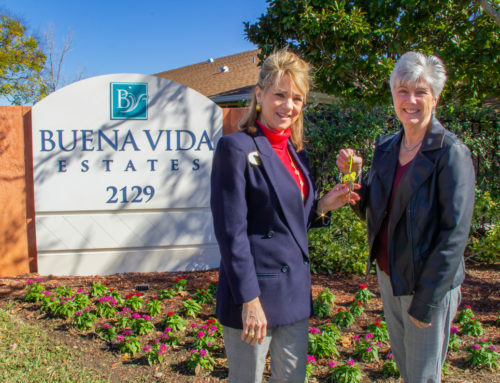 When Josephine came to live at Buena Vida she brought a bell honoring her late husband and presented it to Buena Vida. It has been in the pub, but on a shelf too high for most people to notice. 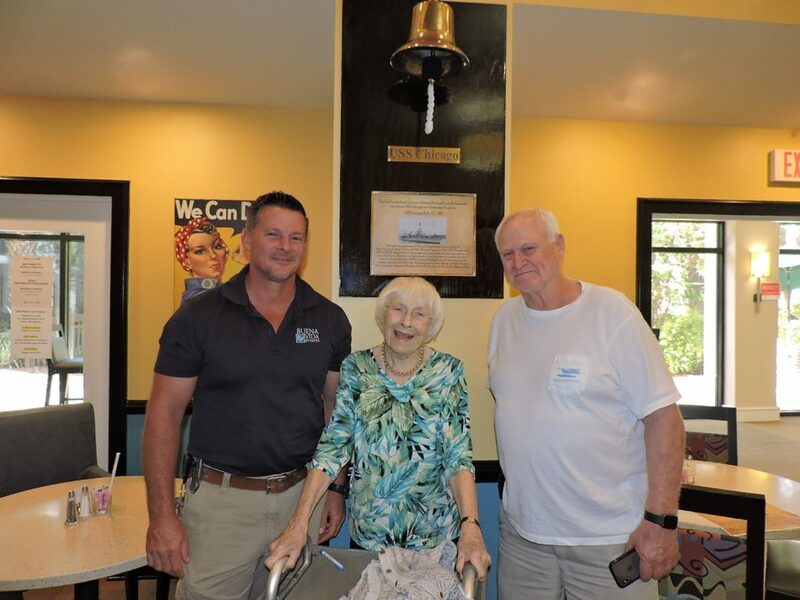 The bell has recently been relocated on the wall in a prominent position with a plaque giving its history. 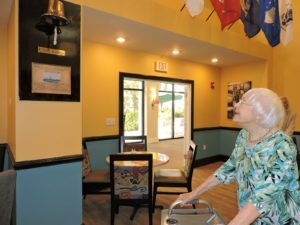 Residents are eagerly anticipating the ringing of the bell by Josephine on her 100th birthday on October 3rd.